A family of “bee-nevolent” residents were relocated from Pensacola State College to sweeter climes – well actually Pace – on Friday afternoon. 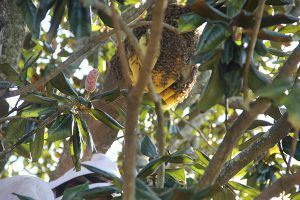 Beth and Chad Cooper of Cooper Taxidermy removed a 100,000-plus honey bee colony that had built a multi-layered hive in one of the Magnolia trees near Ashmore Auditorium. 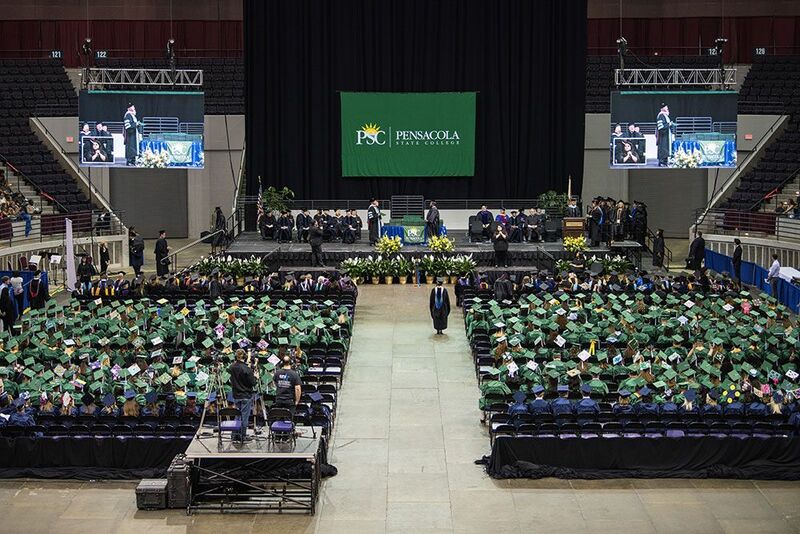 Beth Cooper, a 2008 Pensacola State College graduate and 2010 University of Florida-Milton grad, said the entire hive (queen, drones, worker bees, babies and larvae) were going to her family’s “beekeeping” operation in Pace. 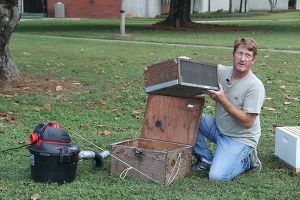 Using protective gear, Chad Cooper used smoke to force the honey bees to fly away from the hive. When they returned, he vacuumed most of them into a holding box for transportation. He then removed the multi-layered honey comb by breaking it into several pieces. 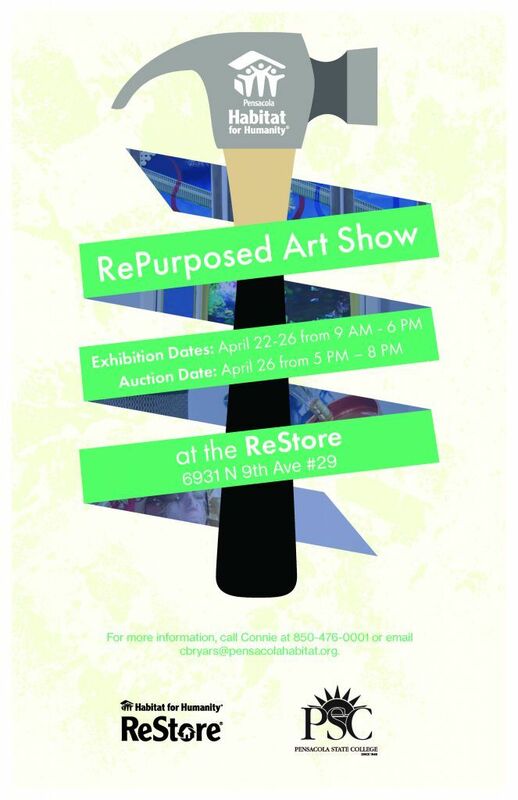 Beth Cooper placed the layers – that looked like a stack of pancakes – into several wooden frames that will hopefully become the honey bees’ new homes. 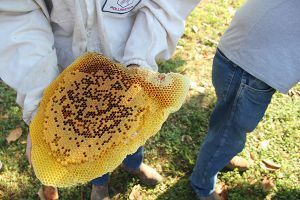 Diane Bracken, Pensacola State’s director of the college’s Facilities, Planning and Construction Department, said the Coopers were called in after grounds crews spotted the hive. “They were working near Ashmore and saw the hive. We decided the environmentally-responsible thing to do would be to have it relocated rather than destroying it,” Bracken said. According to the American Beekeeping Federation, some crops, including blueberries and cherries, are 90-percent dependent on honey bee pollination. And almonds depend entirely on honey bees for pollination at bloom time. A 2010 Cornell University study revealed that managed honey bees contribute more than $19 billion to the U.S. crop production. 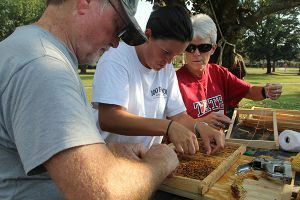 The honey bees’ removal attracted quite an audience – including a WEAR-TV cameraman, a “Corsair” reporter-photographer team and Pensacola State faculty and staff members. Rhonda Basler, administrative assistant in the college’s marketing department, also was “bee-witched” by the honey bees. The Coopers who started the family “beekeeping” business this year – Chad’s father and Beth’s mother also help the couple – said it’s important for property owners to call in professionals when they find a honey bee hive. “Honey bees help everything, but most importantly, they pollinate flowers and crops. We definitely don’t want to lose honey bees,” said Beth Cooper, who has a bachelor’s degree in natural resource conservation and forestry.